Everyone ready for their weekends? I know I am, and in honor of the stress I intend on relieving tonight, lets blow off a little more steam with a red hot fitted. The cap you see above is the home cap of the Visalia Rawhide. The Rawhide, who are the single A affiliate of the Arizona Diamondbacks, play in the North Division of the California League. They are currently in their third season as the Rawhide, after the recent change in name from the Oaks, which they had been since 1995. The club gets their new name from one of the biggest income producers in Tulare County, Holstein Bulls. Holstein bulls are a large contributer to the success of the dairy community, and as a result Visalia is one of the largest providers of milk in the county. The "hide" play their home games at Recreation Ballpark; a 1,888 seat facility, which opened its doors in 1946. This is definitely one of the lower capacity parks I have ever heard of, being that it houses less fans than college parks I've been to. The teams mascot is named tipper, after the fun loving past time of "cow-tipping" which was put on display in the classic Chris Farley film Tommy Boy. If "Tipper" believes in being due, he should be extremely optimistic; the Rawhide franchise hasn't won anything since 1978 when they won a league title. Keep your head up Tipper, your team only plays in front of remotely no one, and never wins, but it's only a matter of time!...or something. The sweet cap featured above features a black brim, black crown, and has an encircled V as if to imitate a branding iron. Cool cap, which features a cultural icon in reflection of the culture of the area. 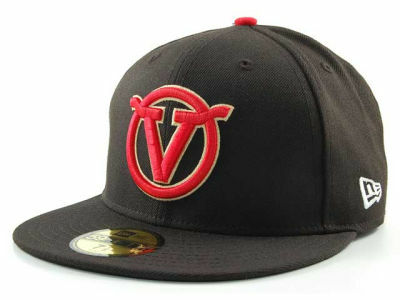 The cap is available here: http://www.lids.com/MiLB/Visalia-Rawhide/20214319 Pick it up if you like it, if not at least you learned something new today. Until tomorrow, peace out cub scouts. This is a great hat. Love the V!